Imagine a rainforest teeming with life, all around are trees reaching seemingly to the sky, monkeys swing though the branches, vividly coloured birds shout noisily to each other, butterflies flutter by flowers, wire haired pigs snuffle in the dirt, underneath our feet tree roots form a dense mat. All these and many more plants, animals, fungi and bacteria are living interlinked lives, all part of a complex and dependent ecosystem. This level of complexity with micro habitats, different species and a sensitive ecosystem all exists in your gut. The gut microbiome is the community of micro-organisms that lives inside your intestines. Each of us has thousands of species of bacteria and fungi, which differ from each other more than a lion does from a jellyfish. These gut microbiota are not passive travellers that accompany us through life. They have an active role in digestion and absorption of food and even influence our immune system. 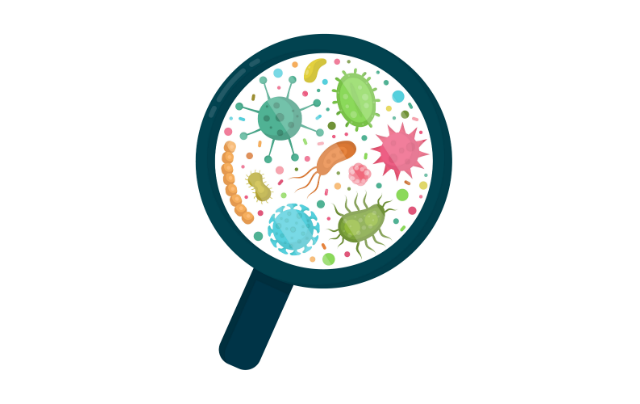 There are many thousands of different species of bacteria present in every individual, but the dominant species of bacteria can differ from person to person. Having an unhealthy mix of gut bacteria has been linked to obesity, diabetes, auto-immune disease and depression. Having a healthy balance of gut bacteria is also critical to healthy ageing. Luckily there are steps you can take to ensure a healthy gut microbiome to live a long and healthy life. Before we can access the nutrients in the food we eat, it needs to be digested, or broken down into small enough particles to be absorbed into our cells. Although our bodies produce many enzymes that break down food, we cannot access all the available nutrients. Gut bacteria in the large intestine breakdown otherwise indigestible components of food, such as fibre, providing up to 10% of our daily energy. Some of these bacterial products actually are key nutrition sources for cells in the intestine and liver. These bacterial products also regulate appetite by increasing the release of hormones give a feeling of satiety. The bacterial products of healthy bacteria even have an influence on the immune system by decreasing inflammation. As people age, the gut microbiome changes and becomes less diverse. The dominant species of bacteria also change. These changes are related to things like hospital admission, medication use and dietary changes. In particular, eating a diet that is low in fibre can deplete certain species of bacteria. Some of these changes may also be related to the physiology of ageing. As people age, there can be changes in the immune system that lead to constant low-grade inflammation, which may also influence the which bacterial species predominate. When there is less diversity in the gut, this gives the opportunity for bacteria to take over that can cause disease. Not all people will have the same health status in older age. Older adults who have less physical reserve are described as frail. People who are frail are much more vulnerable to the development of new disability, from a seemingly minor insult. The cause of frailty is incompletely understood, but there is a strong association with inflammation, or inefficient activation of the immune system. Frail older adults have a much less diverse gut microbiome than robust older adults. This in turn might increase inflammation and lead to increased frailty. This can also lead to more disease causing bacteria growing in the gut, which can lead to infections, like urinary tract infections and pneumonia. We still have so much to learn about the bacteria that live with us. Looking at the bacteria present in faeces doesn't necessarily tell us which are the bacteria most important for health. Commercial probiotic tablets only carry a limited number of bacterial species, and as yet there is no evidence that these have any impact on ageing. The dominant bacterial species in your gut will depend on what you feed them. Bacteria reproduce very quickly and the rate of reproduction for a particular species of bacteria is influenced by whether its’ preferred ‘food’ is available. Changing from a diet high in sugar and processed foods to one high in fibre can rapidly change the profile of the gut bacteria. High fibre foods include wholegrains, vegetables, fruit and legumes. Inclusion of a large number of vegetables has another benefit for gut bacteria. Polyphenols are naturally occurring chemicals in plants that can increase the number of health associated gut bacteria. These can also be found in red wine and chocolate. It is only in the last few years that we have started to understand the importance of the gut microbiome, and there is still so much to learn. While there are no direct therapies to enhance the microbiome for ageing, it is clear that our diet plays a key role in creating the right environment. By eating a diet rich with fresh, whole foods you can gain trillions of tiny allies in the path to healthy ageing.